Will FM3-24 fight piracy (the RIAA kind, not the swashbuckling kind)? As part of the effort to revise FM3-24 Counterinsurgency, the U. S. Army COIN Center released a series of questionnaires in advance of the May revision conference. One thing I noticed has stuck in my craw since I first read the questionnaire in, well, question. Even though proponents and detractors of that American practice of war we call “COIN” agree that it constitutes a “wicked”–if not impossible–problem to perform as a foreign occupier, the U.S. Army at least considered taking on one more problem: music piracy. That is question #15 in the revision questionnaire, falling under the heading of “Operational Environment/Threat.” Although I have attended the COIN Center webcasts discussing the progress, I did not attend the revision conference itself so this idea may have been squashed a long time ago. However, I do think it is telling that the Good Idea Fairy made even a fleeting appearance with this suggestion. Think for a moment on the issue of piracy whether it is software, music, or movies. In the United States, piracy persists even though we do not have a flourishing insurgency, the government exerts robust control over its territory, and potential penalties are not unsubstantial. Yet, someone thinks it is a good idea to have warfighters police music piracy in a country where not only the host nation (let alone the village and tribal units) could care less. Do you want to drive some impoverished vender to the insurgency over someone else’s intellectual property? More importantly, do you really want Americans braving IEDs and ambushes to protect some tiny sliver of an entertainment company’s bottom line? Let the host nation sort that out once they have a marginally functional state–and, frankly, whoever inherits the Afghan state, such that it is, will have their hands full not meeting the same grisly end as Mohammad Najibullah. It has been far from proven that the United States military establishment can perform even the basics of counterinsurgency. It is not simply that the U.S. has bigger fish to fry; the U.S. has not learned to catch fish–much less filet and fry them. The more I read in terms of reportage like like Rajiv Chandrasekaran’s Little America the less confidence I have in leadership to engineer anything approximating a favorable outcome in Afghanistan. 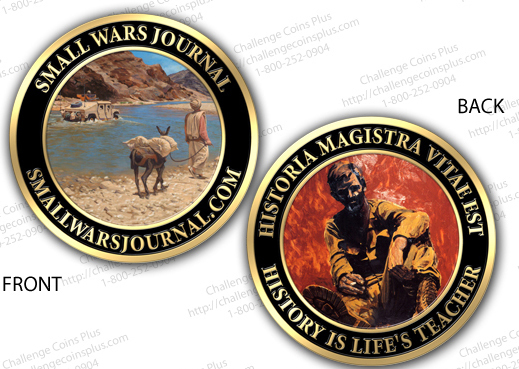 Not every Small Wars Journal reader is a COIN advocate, but every Small Wars Journal supporter does get a coin. Challenge coins are a non-official sign of appreciation or acknowledgement within the U. S. military and law enforcement circles. In this spirit, the Small Wars Foundation would like to acknowledge those who donate $50 or more with an official challenge coin. For more details, see the Small Wars Journal blog. Since I last posted, I have been busy with a number of projects other than blogging–not the least of which are (1) finishing my dissertation and (2) finding a job. Neither of these has been particularly easy lately, but I have been making slow but substantive progress on the dissertation. I have changed directions somewhat, focusing on representations of T. E. Lawrence and contemporary conceptions of counterinsurgency from doctrine to pop-culture. It’s more doable, for one. My initial proposal was good for about four dissertations. Secondly, my committee is more amenable to the topic–knock on wood. Frankly, I am not sure what the time table for completion will be yet. P. S. If you need someone who is wicked smart and knows a bit about small arms, counterinsurgency, cyberwar, and lots of other cool sh…stuff, I’m your guy.